Ghostbusters T-Shirt by Riccardo Bucchioni aka rbucchioni. 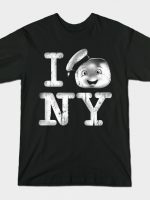 A very cool I heart NY t-shirt for fans of Ghostbusters. The heat is replaced with a Proton Pack.